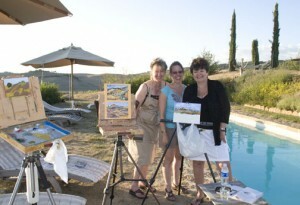 See ArtTreks.org for details on past and upcoming trips. It’s time to venture into a new part of the world with our Art Treks destinations, Slovenia & Croatia. We will commence our adventure in the old world section of Ljubljana, move to an exploration of the waterfalls at Plitvices Lakes National Park and culminate in the storybook setting of Lake Bled. You will also have the option of extending the adventure for 4 additional days in Croatia, so read all way to the end! Come with us as we take in the sights on the first leg of our journey in Ljubljana. 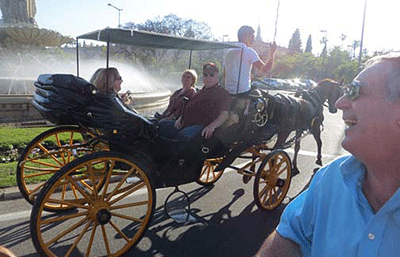 Enjoy the scenery as we glide by on a cruise through the heart of the city, before heading into the old square. Marvel at the view from the funicular as you climb towards the imposing castle situated on top of the hill overlooking the city. Add to this the cathedrals, old world architecture and dragon bridges, and it makes for one great start to an amazing adventure! e for exploring the cultural side of the area. There will also be plenty of time in between for shopping, sightseeing or to dine al fresco for a leisurely lunch.Scott will take the photographers on a daily walking tour, giving you the opportunity to experience the trip through your lens as he guides you to use your camera to define what you see while achieving your own artistic vision. As with the painters, there will be half day destinations, with time allowances for exploring on your own.This unique Workshop affords you the option to choose which aspect interests you, whether it is painting, photography or both. 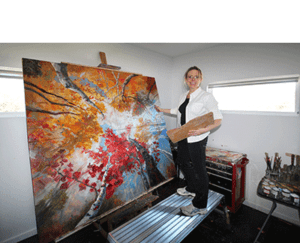 Thereby giving you an opportunity to make the most of your Art Treks experience.There will also be valuable critique sessions throughout the workshop. This will give everyone an opportunity to discuss the day’s events, compare notes, ask questions and get a chance to know each other. It also presents a unique option to get views and perspectives from both painters and photographers.So come join us as we take you on an inspirational exploration of Croatia & Slovenia with an emphasis on observation and perception as we help you develop your own style – or just ride along to enjoy the countryside, as artists and non-artists alike are welcome.Space is limited to 12 participants on a first-come basis, so we encourage you to enroll as soon as possible. There will also be space open for non-participating partners at reduced rates on a limited basis. Roundtrip air fare, private van transportation to Ljubljana, Plitvices Lake National Park and Lake Bled. Your cost for all of this is $4,195 and to reserve a spot, simply send a completed application form along with your deposit of $1,500 per person by 5/6/17, after that the price goes to $4,795. There also is a final application cut off date of 10/7/17. Prices after the cut off date are based on current airfare. A second payment of one half of the remainder after deposit is due by 8/12/17, with a final payment due by 10/28/17. For those wanting a single occupancy room, there will be an additional cost of $750. We can take credit card payments, however it will incur a 3.5% fee. There has to be a minimum of 6 people for the workshop to make. If the 6 person minimum is not met by the deadline, deposit will be refunded. For those people interested in extending the Croatia part of their adventure, we will be continuing on for another 4 days of cultural experiences. 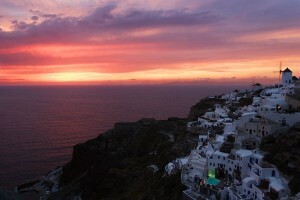 This part of the journey is geared more towards the epicurean side of travel. 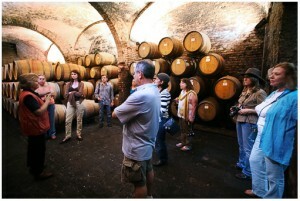 Which will include sampling some of the best food and wine that Croatia has to offer. We will continue our trek by flying to Dubrovnik, where our 4 night stay will be in 4 star accommodations with views of the harbor and will serve as our base of operations. Admire this pearl of the Adriatic as you stroll atop the ancient city walls gazing out across the shimmering azure sea or just wander the marble paved streets marveling at the baroque buildings. No trip here would be complete without a boat excursion around the harbor or a cable car ride to the top of the mountain for views of the city. some simply extraordinary wines. So we will venture forth to the Peljesac peninsula to stop in and sample various wines from a selection of the best wineries in the area. If you are going to be there, you have to go to Mali Ston bay for an assortment of seafood. Your cost for the extra 4 days of taste bud pleasing adventure is $1,500, for a total of $6,550 for the entire 12 day extravaganza. To reserve a spot, simply send a completed application form along with your deposit of $2,000 for the entire trip per person. There is a final application cut off date of 10/28/17. Prices after the cut off date are based on current airfare. In the event of inclement weather, arrangements will be made for museum visits etc. There will be no rain dates or refunds for weather or travel difficulties, we suggest travel insurance for those situations. Email Scott, photoguy@blind-squirrel.org if you are interested in joining us. There will also be valuable critique sessions throughout the workshop. This will give everyone an opportunity to discuss the day’s events,compare notes, ask questions and get a chance to know each other. 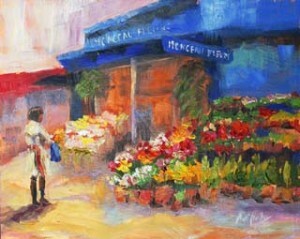 It also presents a unique option to get views and perspectives from both painters and photographers. 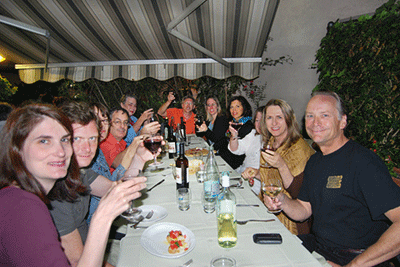 Roundtrip air fare, private van transportation to Cinque Terre & Lake Como. Your cost for all of this is $5,395 and to reserve a spot, simply send a completed application form (the forms will be provided by email upon request) along with your deposit of $1,500 per person. There is a final application cut off date of 1/6/18. Prices after the cut off date are based on current airfare. 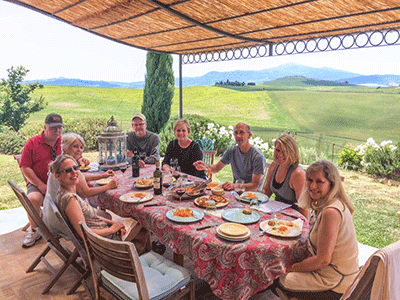 There is also the option of combining the Tuscany trek with this one, thereby making both our Italy Workshops into one fantastic two week Italian adventure. The cost for that would be $6,995 with a $2,500 deposit per person by 9/23/17, after that the price goes to $7,995. Since our adventures have been mostly to Europe, we thought that it was finally time to visit our kindred nation, Great Britain. This Trek will acquaint you with some of the best that London has to offer, along with a stop in the old Roman town of Bath and culminating in the picturesque Cotswolds. The initial stop on our London journey brings us to the residence of the Yeomen Warders, the Tower of London. With the Beefeaters as your guide you will get the opportunity to experience all the Tower has to offer first hand. From its origins as a castle, and its many incarnations as a mint, a menagerie, an armory, a prison and of course as a treasury, with the celebrated Crown Jewels. Our continuation through London moves along the life blood of the city, with a cruise down the Thames. Where you will view the city from this unique perspective as your guide regales you with some fascinating tidbits of London’s rather interesting architecture, finally disembarking at the famed Big Ben and Westminster Abbey. As part of our art appreciation, we will take time to visit one of the best museums in the world, the National Gallery in Trafalgar Square. For those interested in extending their art experience, we will also carve out a little time one evening to take in a show in one of London’s many theaters. This adventure will take us throughout the city, hitting as many highlights as possible, but it will also afford you free time to visit any of their other many attractions. Whether it would be going up in the London Eye, touring Churchill’s War Rooms, viewing other museums, venturing into Westminster Abbey or just walking through a park. As enjoyable as London is, we must proceed onward to our next stop, the royal palace that Henry the VIII called home, Hampton Court. This amazing Tudor palace with its stunning gardens presents many opportunities for the artistic soul to feed upon. Continuing on brings us to our final way station, the simply spectacular Cotswolds! Once again, finding unique lodging for our stay, we will reside in a 350 year old B&B, with one of the best restaurants around. This area is an artists delight, step back in time where the landscape is dotted with thatched roofed cottages, quintessential English gardens, flowing streams and Medieval castles. From our home base we will also travel to the Roman city of Bath, where its vast array of options caters to your every whim. Walk along the river for the remarkable view of the Pulteney Bridge, stop in at its Abbey, the last Gothic church in England, explore the 2000 year old Roman baths or simply indulge yourself in High Tea. This adventure has a little bit of everything that England has to offer. 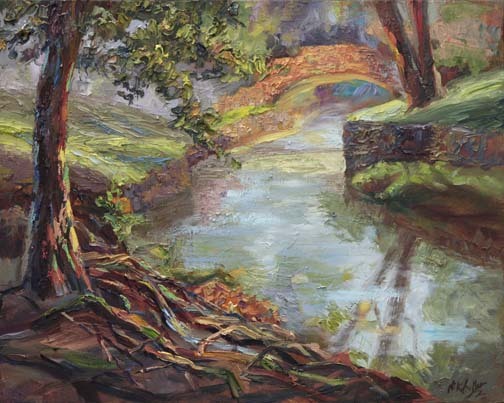 Niki will conduct the Plein-Air Painting Workshop from different picturesque locations daily, teaching through a combination of demos, discussions, assistance and critiques. Sessions will be broken into different morning and afternoon locations, with plenty of time in between for shopping, sightseeing or to dine al fresco for a leisurely lunch. Scott will take the photographers on daily walking tours where you will have the opportunity to experience England through your lens as Scott guides you to use your camera to define what you see while achieving your own artistic vision. As with the painters, there will be daily destinations with time allowances for exploring on your own. There will also be valuable critique sessions throughout the workshop as time allows. This will give everyone an opportunity to discuss the day’s events, compare notes, ask questions and get a chance to know each other. 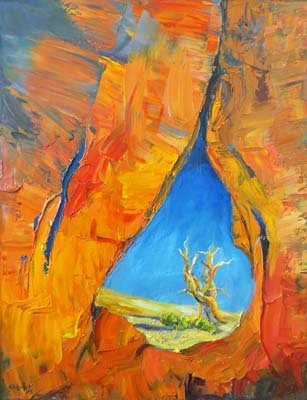 It also presents a unique option to get views and perspectives from both painters and photographers. So come join us as we take you on an inspirational exploration of London and the Cotswolds with an emphasis on observation and perception as we help you develop your own style. Admission is limited to 12 participants, so we encourage you to enroll as soon as possible. There will also be space open for non-participating partners at reduced rates on a limited basis. Roundtrip air fare, breakfast & all transfers, including private van transportation to the Cotswolds. Side trips along the way to Bourton-on-the-Water, Bibury, Lower Slaughter and Chipping Camden, as well as to the Roman town of Bath. Instruction, guidance, experience and fun. 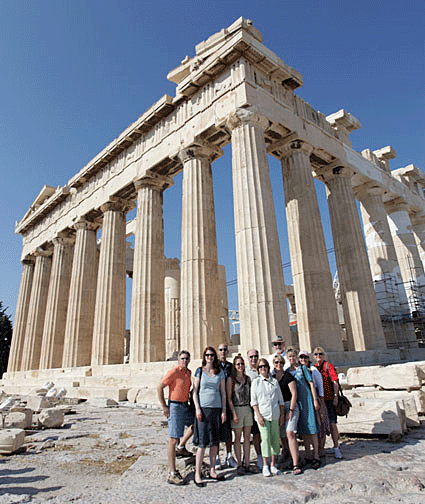 Get inspired from the ancient beauty of Greece as you join us for this amazing opportunity to sharpen your skills while enjoying one of the most picturesque landscapes in the world. 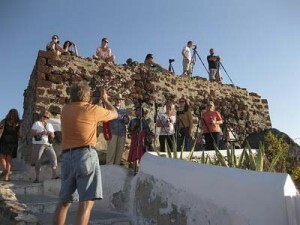 Learning has never been as much fun as it is with this unique workshop that takes both painters and photographers on a tour through the cradle of civilization. The best part is that you get to choose which aspects of the workshop interest you – whether it is learning how to paint quickly to achieve the mood and changing light of the scene or deriving the most out of your camera as you capture one of the most beautiful places in the world, Greece. This workshop will open your eyes to a new view of your art as we push you on a personal journey to expand your creativity. 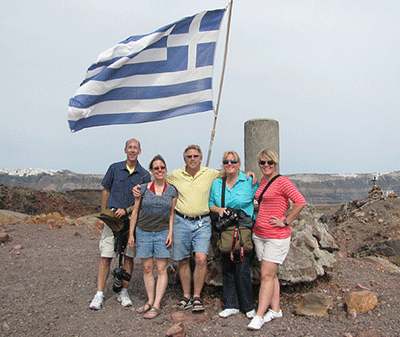 You will experience the sights, sounds and passion of Greece as you are immersed in its culture. See Athens spread out from the Acropolis, explore the cliff side views of the blue domes and white washed buildings set against the cobalt water of the Agean or watch the sun set next to the windmills at Ioa. This is an opportunity to have one of those adventures that you will talk about for years, all while you improve on your artistic skills in a real world setting. Scott will take the photographers on a daily walking tour along the caldera and through the back streets that make Santorini one of the truly wondrous spots on earth. 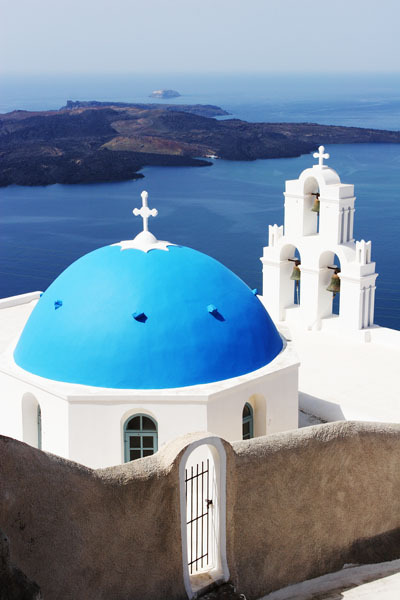 You will have the opportunity to experience Greece through your lens as Scott guides you to use your camera to define what you see while achieving your own artistic vision. As with the painters, there will be daily destinations with time allowances for exploring on your own. There will also be valuable critique sessions throughout the workshop. This will give everyone an opportunity to discuss the day’s events, compare notes, ask questions and get a chance to know each other. 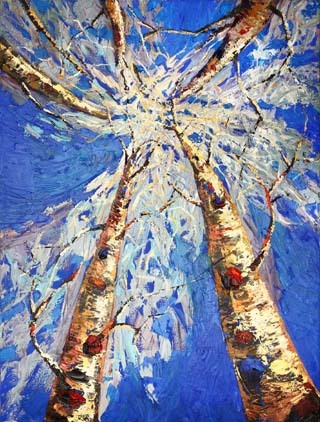 It also presents a unique option to get views and perspectives from both painters and photographers. 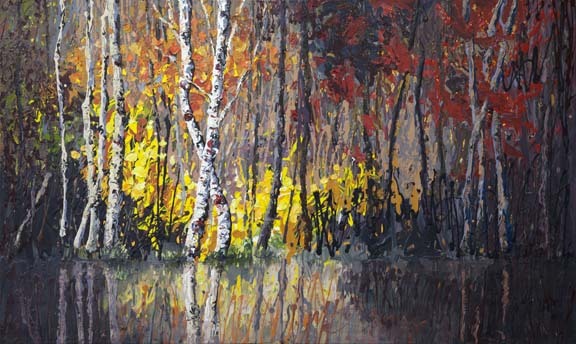 Niki has been painting for more than 20 years, and is a nationally acclaimed artist whose work is much sought after and collected, as well as being an accomplished painting instructor with years of experience. Scott’s artistic work is also gaining critical attention, he has taught 3 years of college photography, has helped guide workshops in Santa Fe, is a guest lecturer and is a working commercial photographer. 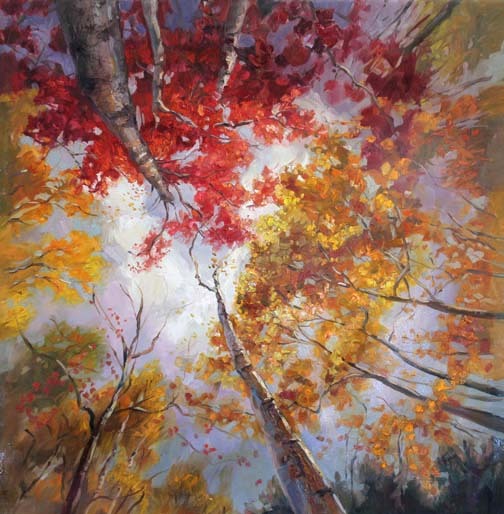 Having taught several European workshops, both Niki and Scott are passionate about art and love helping others refine their skills while guiding them to find their own muse in life. So come join us as we take you on an inspirational exploration of Greece with an emphasis on observation and perception as we help you develop your own style. Admission is limited to 12 participants, so we encourage you to enroll as soon as possible. There will also be space open for non-participating partners at reduced rates on a limited basis. * Roundtrip air fare, all transfers. For those wanting a single occupancy room, there will be an additional cost of $750. There has to be a minimum of 6 people for the workshop to make. If the 6 person minimum is not met, deposits will be refunded. First payment of one half of remainder after deposit is due by 12/14, with final payment due by 1/25/15. We can take credit card payments, however it will incur a 3% fee. There is a discount of $350 for partners wanting to accompany participants on the trip, but not take the workshop. In the event of inclement weather, arrangements will be made for museum visits, etc. We suggest travel insurance for unforeseen circumstances as there are no refunds. Please let us know if you have any questions or if we can help you in any way. We hope that you will be able to join us! To see more information about Scott Williams, visit blind-squirrel.org. E-mail Niki@NikiGulley.com or call 214-803-5812 if you would like to receive more information or register. The French Riviera, just saying it brings to mind exotic locations, beaches, fabulous estates, casinos and amazing scenery. 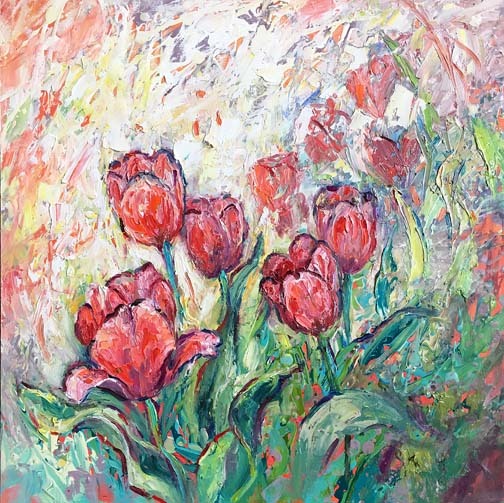 It’s one of those areas that artists have been flocking to for ages, Monet, Matisse, Renoir, Picasso and Chagall just to name a few. With the incredible luminosity of the light along the Mediterranean coast, setting off the contrasting colors and the exuberance of the natural landscape of the Cote d’Azur, it is truly an inspiring destination. Once again, if you are a painter or photographer, we have designed this workshop to expand your creativity and further your artistic voice. Choosing which aspect interest you, where we will help guide you to capture on canvas or film, the spectacular architecture and rich tapestry, that can only be found in the French Riviera. Join us on our journey to some of the best place the Riviera has to offer, Nice, Monte Carlo, Eze, Villefranche and St. Paul de Vence. 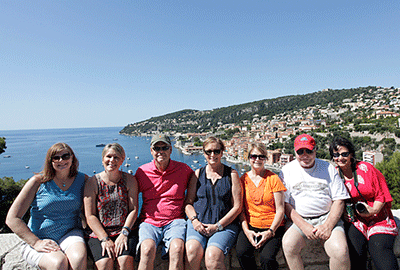 As one of the region’s most sought after resorts, Villefranche-sur-Mer will serve as our home base as we experience all of the best of the Riviera. 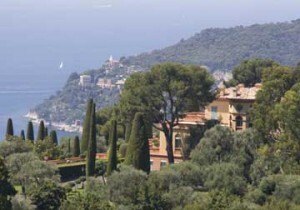 With probably one of the world’s finest seaside strolls along the broad beach promenade, its picturesque harbor views and sweeping vistas from atop its hills, Nice is the undisputed queen of the Riviera. 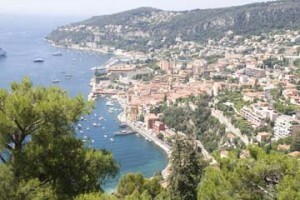 Next up, with it’s impressive perch looming over the sea, Eze is the highest seaside village in France. Wandering the old stone streets you can almost feel the medieval city that it once was, then cast your gaze across the sea below from the gorgeous views at the top of the Exotic Garden. For a complete change of pace, dust off your tuxedo and do your best James Bond impression as we take you to Monte Carlo for a roll of the dice in the elegant casino. If craps aren’t your game, there is plenty to see and do in Monaco. Feeling a little more lavish, how about a morning spent wandering the grounds and touring the mansion of the Rothschild estate, followed by an afternoon in a Greek garden? Finally, what trip would be complete without some art and wine! 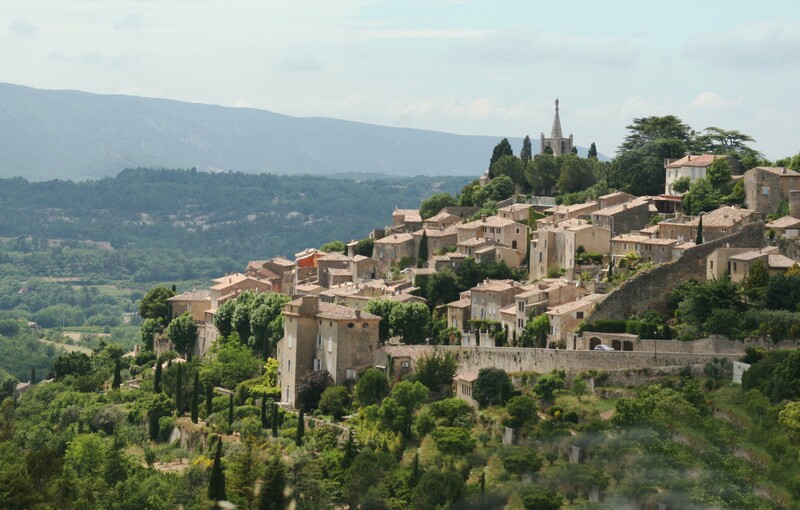 So it is on to St Paul de Vence, this hilltop village has been home to some of the finest artists of the area, many of which are represented at the Foundation Maeght. 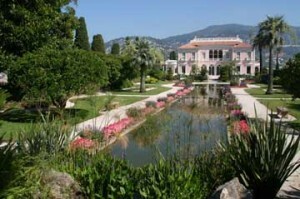 We will also make a pilgrimage to Renoir’s house/Museum before finishing at a local winery. 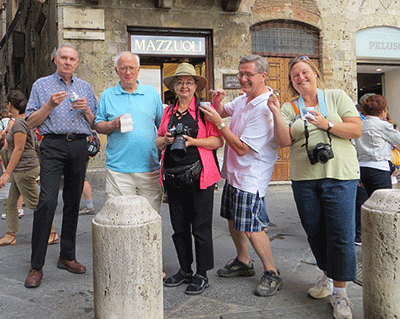 Scott will take the photographers on daily walking tours where you will have the opportunity to experience France through your lens as Scott guides you to use your camera to define what you see while achieving your own artistic vision. As with the painters, there will be daily destinations with time allowances for exploring on your own. There will also be valuable critique sessions throughout the workshop as time allows. This will give everyone an opportunity to discuss the day’s events, compare notes, ask questions and get a chance to know each other. 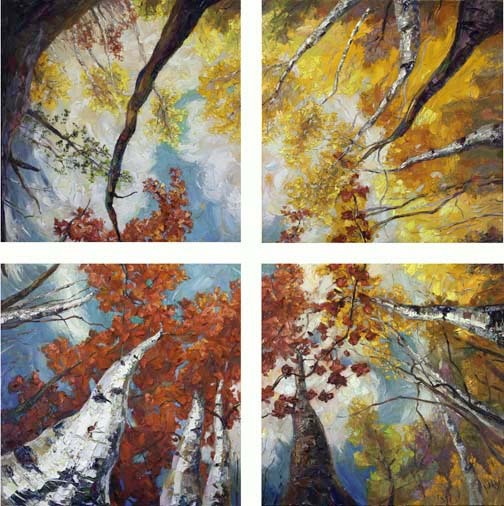 It also presents a unique option to get views and perspectives from both painters and photographers. So come join us as we take you on an inspirational exploration of the Riviera and its surroundings with an emphasis on observation and perception as we help you develop your own style. * Instruction, guidance, experience and fun. Like Paris, Provence is someplace that evokes strong emotions that beckons the inner artist in all of us. 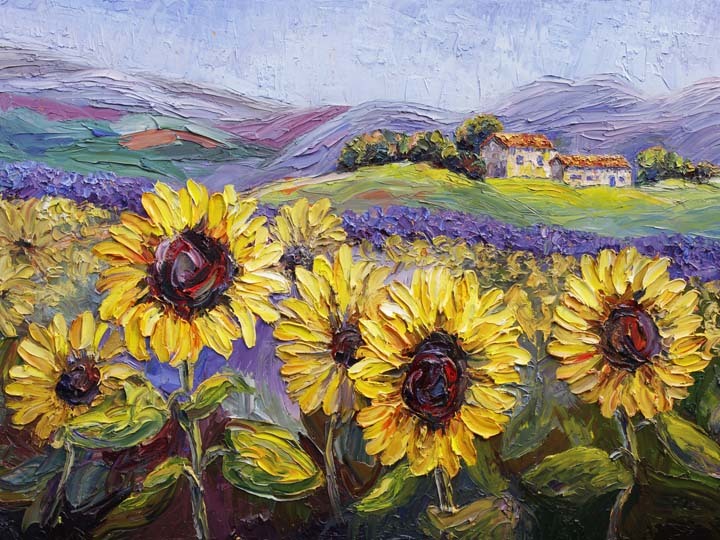 Travel the back roads admiring the country manors, chateaus and castles set among vibrant purple fields of lavender and golden sunflowers guaranteed to make you smile. Add to that some of the best food anywhere and once more, it is someplace that everyone just has to experience at least once in their life. Once again, if you are a painter or photographer, we have designed this workshop to expand your creativity and further your artistic voice. Choosing which aspect interest you, where we will help guide you to capture on canvas or film, the spectacular architecture and rich tapestry, that is Provence. 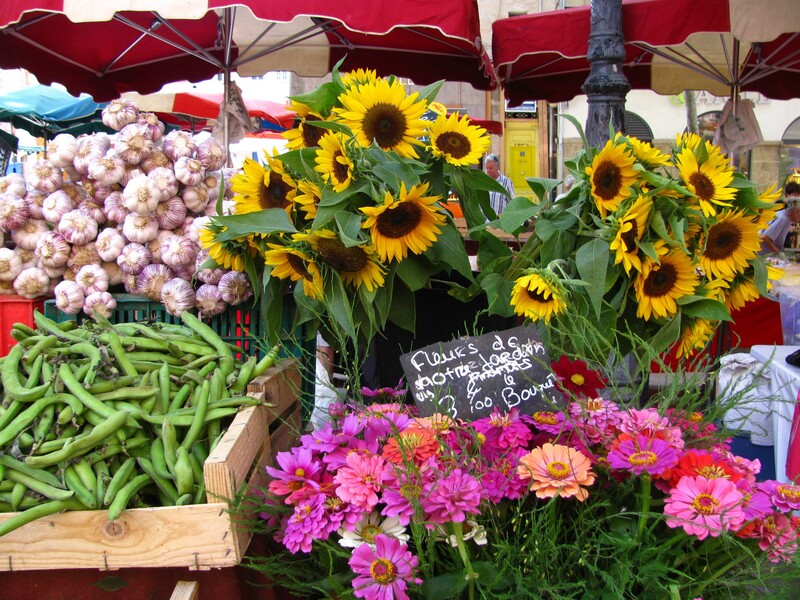 Join us as we explore the abundant riches that Provence has to offer. Imagine the chorus of monks chanting as you admire the commanding views from the ramparts of a thousand year old Abbey. Visualize the spectacle of Gladiators or feel the ground shake as the chariots passed by in one of the best preserved amphitheaters in the world built in 90 AD. 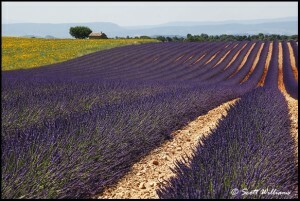 What trip to Provence would be complete without its star attraction, those amazing fields of lavender. 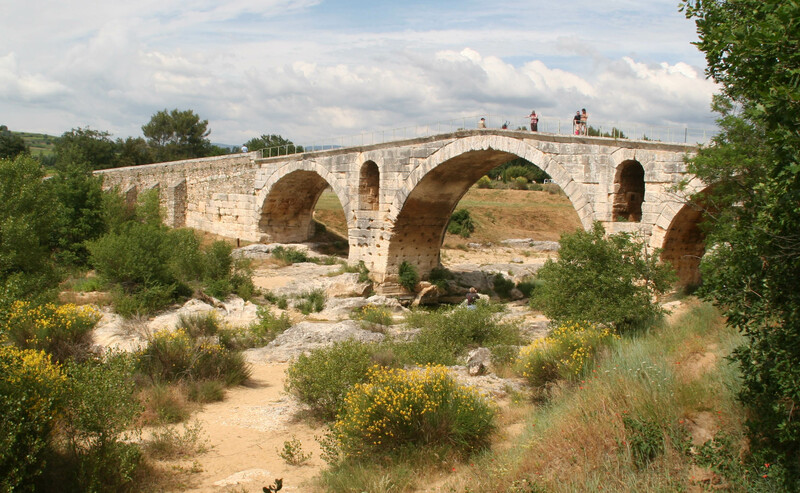 Our excursions will take us in search of that perfect field that captures the essence of Provence.Walk in the steps of Van Gogh through the city of Arles and into the countryside where he spent his time in the asylum. Next spend some time touring in the old city section of Aix viewing their open air markets before poking your head into their cathedral built on the grounds of a Roman temple. If your taste for Roman architecture hasn’t had it’s fill, marvel at this engineering feat as you walk across the Pont Julien bridge dating to 3 BC. These are but a few of the things that await you on your Provence adventure. Once more, as with Paris, Provence has its own style of cooking that amounts to culinary acrobatics where food is a religion and wine carries a Papal heritage. 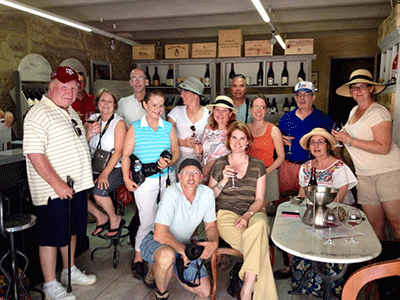 Which means a visit to Châteauneuf-du-Pape for some of the best wines in France. 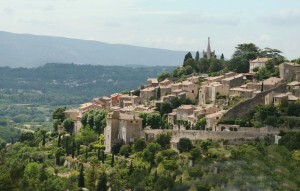 Provence is an adventure around every corner, that is just waiting for you to discover. 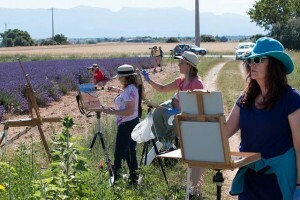 So come join us as we take you on an inspirational exploration of Provence and its surroundings with an emphasis on observation and perception as we help you develop your own style. Admission is limited to 14 participants, so we encourage you to enroll as soon as possible. There will also be space open for non-participating partners at reduced rates on a limited basis. * Abbey de Montmajour addmission. 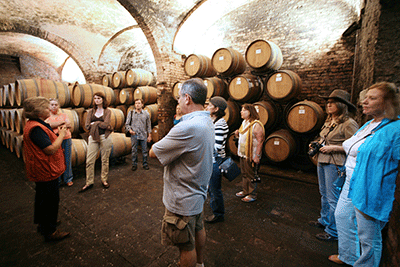 * Wine tasting in Fontvielle & Châteauneuf-du-Pape. 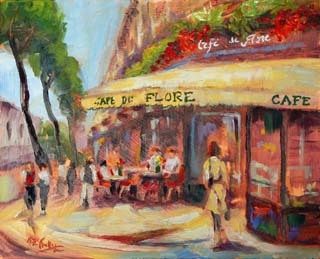 Whether you call it “The City of Lights” or “The City of Love” Paris conjures up a vivid impression in your mind. From its iconic landmarks, to its gastronomic pleasures, to its amazing art and culture, Paris is almost certainly a state of mind that everyone has to experience at least once in their life.Once again, if you are a painter or photographer, we have designed this workshop to expand your creativity and further your artistic voice. Choosing which aspect interest you, we will help guide you to capture on canvas or film, the spectacular architecture and rich tapestry, that is Paris. So take our hand as we guide you along the path where giants have trod. Stand where Monet did before the gothic masterpiece of Notre Dame, whose gargoyles watch over the city and whose flying buttresses changed architecture. Venture into the cafes to envision 1800’s Paris from a table with Toulouse Lautrec or go backstage of the ballet with Degas. These are but a few of the things that await you on your Parisian adventure.Marvel in the modern iron lattice work that many called a folly, but has come to signify a city if not an entire nation, the Eiffel Tower. Take time out to reflect on his genius as you see the city spread out before you from its observation platforms. 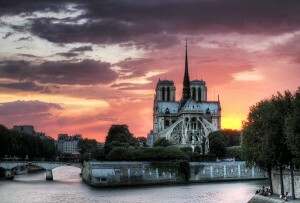 Or experience the flow of the city from the deck of a guided boat tour as we journey down the Seine. 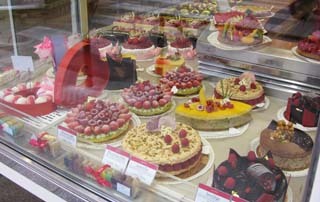 Finally, stop off for a pastry as you stroll through the gardens on your way to the Louvre.Paris is as much a pilgrimage for the senses, as it is for the soul. Savor in its gastronomic explosion of flavors as you dine in a city where food is a way of life and wine is the river that carries it. Revel in the birthplace of Impressionism while you wander the halls of the Musee d’ Orsay or visit the grandeur of the Louvre. Paris is an adventure around every corner, that is just waiting for you to discover. Finally, take a side trip to a palace so grand that it bankrupted a country and split a nation, Versailles. Spend the day among the gardens and fountains imagining what it must have been like to be the king. Although nothing quite compares to the view or experience as you stand along the waters edge gazing out at the bridge in the private garden that Monet created for himself and fueled his passion. 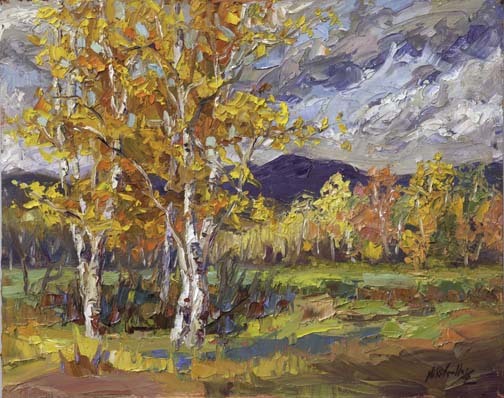 Niki will conduct the Plein-Air Painting Workshop from different picturesque locations daily, teaching through a combination of demos, discussions, assistance and critiques. Sessions will be broken into morning and afternoon locations, with plenty of time in between for shopping, sightseeing or to dine al fresco for a leisurely lunch. Scott will take the photographers on a daily walking tour along the Seine and to the iconic landmarks that make Paris one of the truly wondrous spots in Europe. You will have the opportunity to experience France through your lens as Scott guides you to use your camera to define what you see while achieving your own artistic vision. As with the painters, there will be daily destinations with time allowances for exploring on your own. There will also be valuable critique sessions throughout the workshop as time allows. This will give everyone an opportunity to discuss the day’s events, compare notes, ask questions and get a chance to know each other. 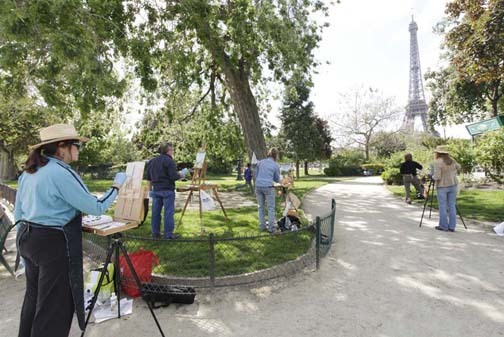 It also presents a unique option to get views and perspectives from both painters and photographers.So come join us as we take you on an inspirational exploration of Paris and its surroundings with an emphasis on observation and perception as we help you develop your own style. * 5 Day Metro Pass. * Boat Tour of the Seine. * Palace of Versailles Admission. 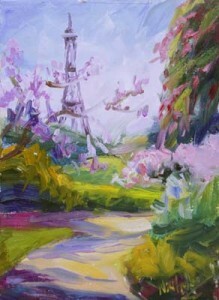 * Monet’s Garden Admission. * Emergency Medical Insurance. For those wanting a single occupancy room, there will be an additional cost of $750. We can take credit card payments, however it will incur a 3% fee. There is a discount of $350 for partners wanting to accompany participants on the trip, but not take the workshop. In the event of inclement weather, arrangements will be made for museum visits etc. There will be no rain dates or refunds for weather or travel difficulties. We suggest travel insurance for those situations. 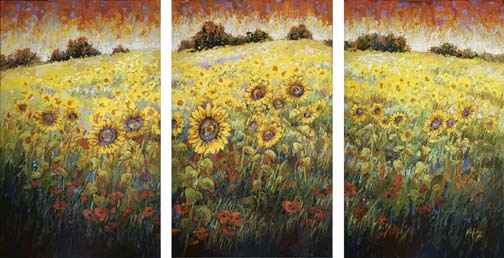 To see more of Scott’s Work, visit his website at blind-squirrel.org. 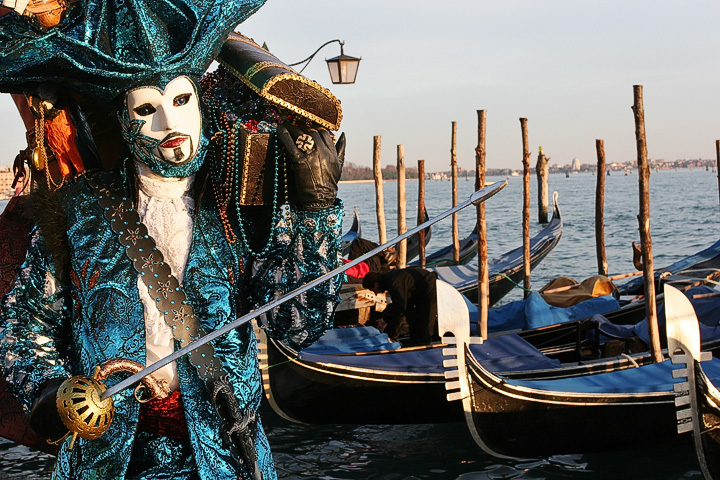 You’ve seen the images of the people with elaborate costumes and ornate masks set against the stunning backdrop of Venice. Well, now is your chance to not only be a part of this fabulous spectacle, but to also capture the festival in all of it’s glory. Imagine working on your photography and painting skills in an environment with such visual stimulation and artistic opportunities. Join Scott as he takes you on a photographic journey among a cast of characters that have stepped out of a long forgotten time as they stroll amid the grandeur of the Venetian canals. 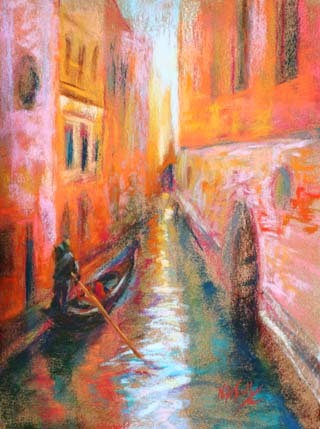 Like our spring workshop, you will experience the sights, sounds and passion of Venice as you are immersed in Italian culture.Niki will conduct the Plein-Air Painting Workshop from different picturesque locations daily, teaching through a combination of demos, discussions, assistance and critiques. Sessions will be broken into different morning and afternoon locations, with plenty of time in between for shopping, sightseeing, or to dine al fresco for a leisurely lunch. 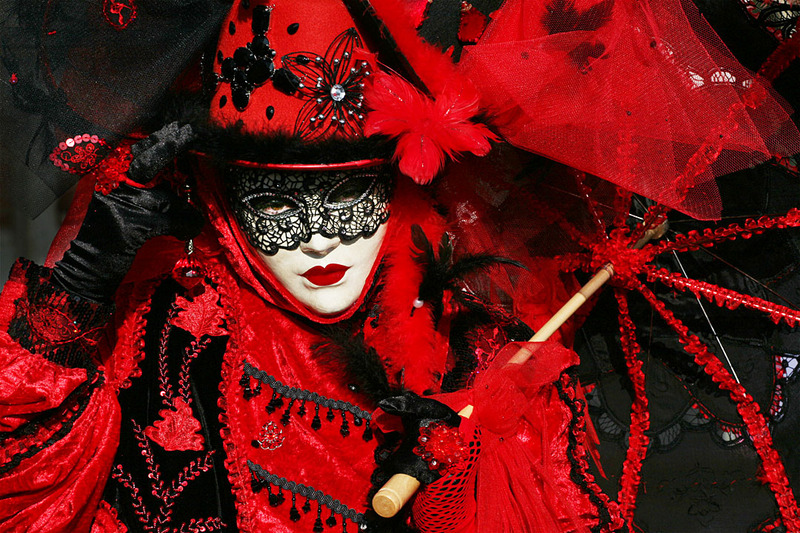 There will be walking tours through the back streets and canals of Venice as we go in search of opulent costumes and dazzling masks in a setting like no other place on earth. There will also be critique sessions throughout the workshop that can provide invaluable information and feedback, as well as giving everyone an opportunity to share ideas and get to know each other. There will also be opportunities each day to see the museums, visit the churches, go shopping and enjoy all of the things that make Venice what it is. * Round trip air fare, all transfers. * Hotel for 6 nights. (Double occupancy) (Accommodations are in shared rooms, although a few single rooms may be available at a n extra fee)* Private boat from the airport. 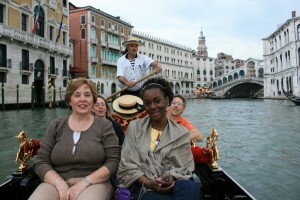 * Boat trip to the islands of Burano & Murano. E-mail Niki Gulley for more information or to register. 214-803-5812. Email Scott Williams at PhotoGuy@Blind–Squirrel.org if you are interested in participating or need more information. Visit Scott’s website at Blind-Squirrel.org for more details. Get inspired from the majestic beauty of Venice as you join us for this amazing opportunity to sharpen your skills while enjoying one of the most picturesque cities in the world. Learning has never been as much fun as it is with this unique workshop that takes both painters and photographers on a tour through Venice. 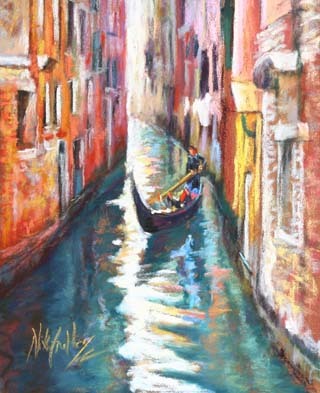 The best part is that you get to choose which aspects of the workshop interest you, whether it is learning how to paint quickly to achieve the mood and changing light of the scene or deriving the most out of your camera as you capture one of the most beautiful places in the world, VENICE, Italy. 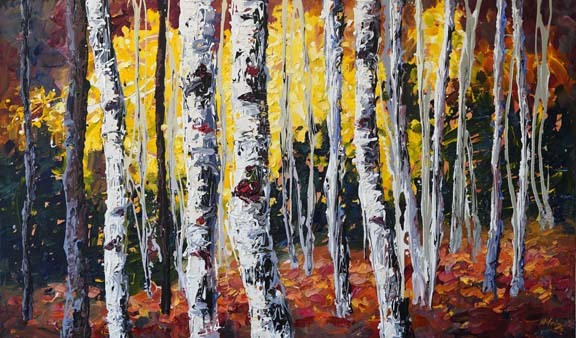 This workshop will open your eyes to a new view of your art as we push you on a personal journey to expand your creativity. You will experience the sights, sounds and passion of Venice as you are immersed in Italian culture. See the city spread out from the bell tower at St. Mark’s, explore the vibrant hues of the homes on Burano, enjoy the canals from the seat of a gondola or watch the sun set along the Grand Canal. 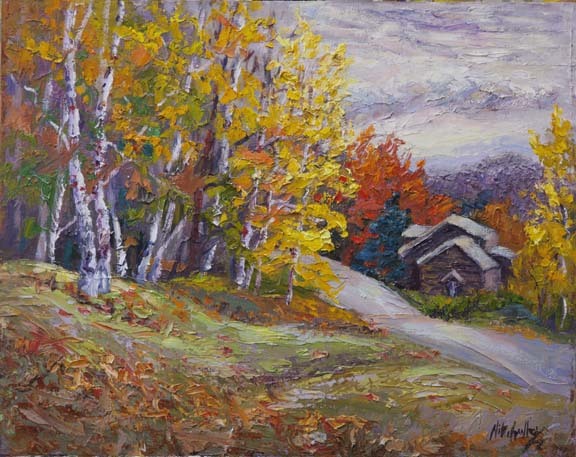 This is an opportunity to have one of those adventures that you will talk about for years, all while you improve on your artistic skills in a real world setting.Niki will conduct the Plein-Air Painting Workshop from different picturesque locations daily, teaching through a combination of demos, discussions, assistance and critiques. Sessions will be broken into different morning and afternoon locations, with plenty of time in between for shopping, sightseeing, or to dine al fresco for a leisurely lunch. Scott will take the photographers on a daily walking tour through the back streets and canals that make Venice one of the truly wondrous spots on earth. You will have the opportunity to experience Venice through your lens as Scott guides you to use your camera to define what you see while achieving your own artistic vision. As with the painters, there will be daily destinations with time allowances for exploring on your own.So come join us on this unique adventure, as we take you on an inspirational exploration of Venice with an emphasis on observation and perception as we help you develop your own artistic style. Admission is limited to 12 participants, so we encourage you to enroll as soon as possible. There will also be space open for non-participating partners at reduced rates on a limited basis. More details and registration deadlines are specified below. 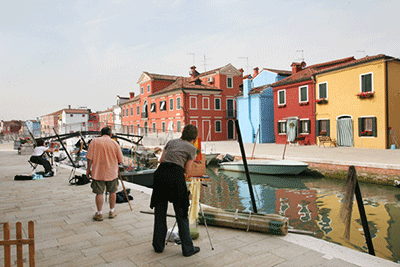 * Roundtrip air fare, all transfers in Venice including a side trip to the island of Burano. In the event of inclement weather, the schedule will be changed with arrangements for museum visits etc. There will be no rain dates or refunds for weather. Please let us if you have questions or if we can help you in any way.We hope that you be able to join us! 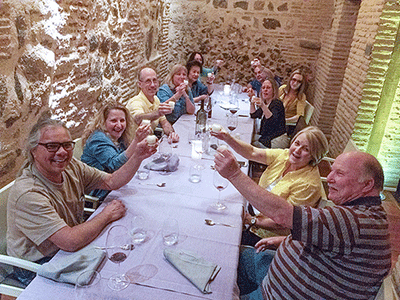 It’s time to explore a new country and give you an opportunity to see new sights, experience a different culture, taste some unique foods and savor some great wines, Spain! 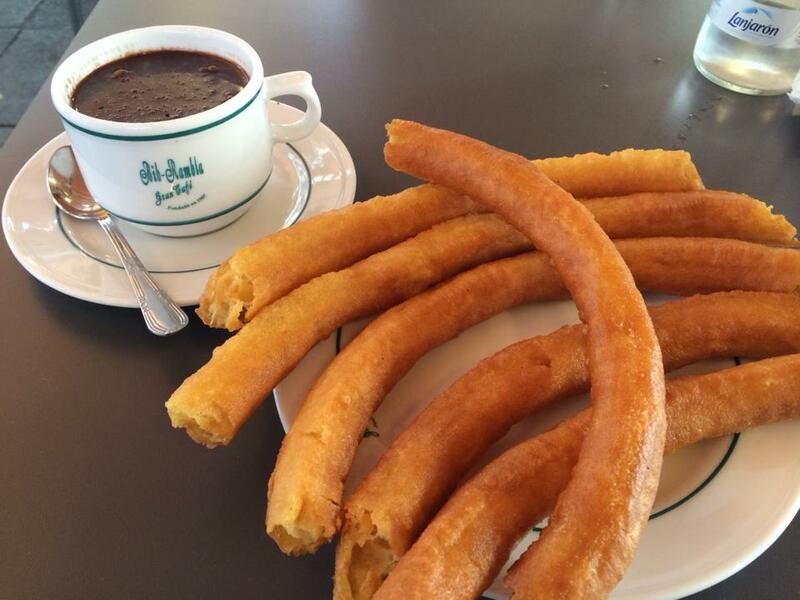 During this excursion we are going to introduce you to some of the best that Andalusia has to offer. Once again, if you are a painter or photographer, we have designed this workshop to expand your creativity and further your artistic voice. 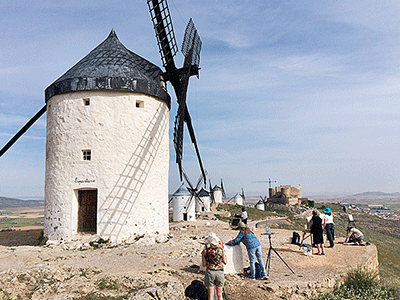 Choosing which aspect interests you, we will help guide you to capture on canvas or film, the spectacular architecture and rich tapestry, that is Spain. 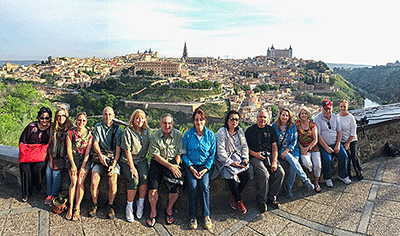 Join us as we take you on a journey through the riches of Andalusia where our trek begins in the amazing city of Toledo, perched atop a hill surrounded by a river on three sides. This fortified city has withstood the ravages of time and affords us a great cultural treasure trove. 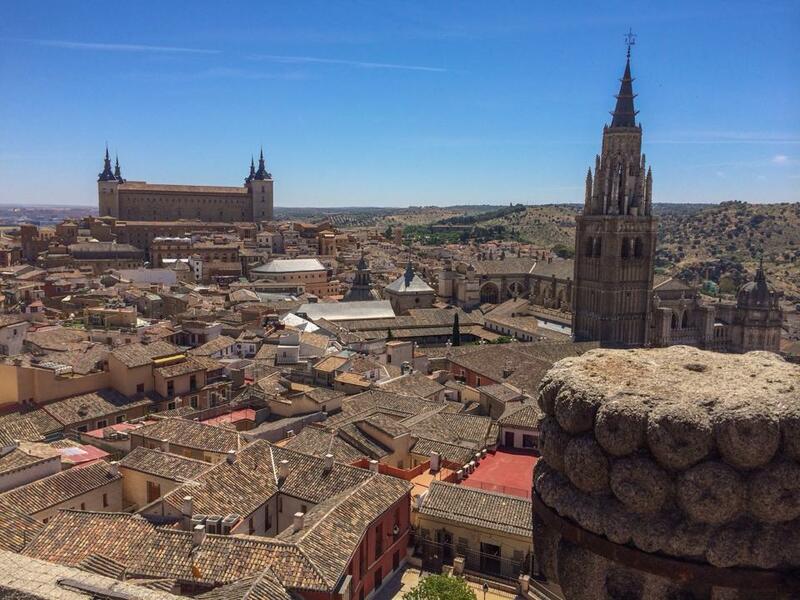 From the works of El Greco, to a synagogue built by the Moors and culminating with the soaring heights of their cathedral that is considered the magnum opus of the Gothic style. 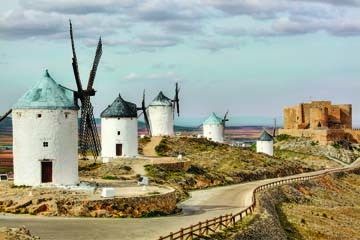 From there we will stop off in La Mancha to tilt at windmills with Don Quixote before venturing on to one of the world’s true architectural marvels, the Alhambra. 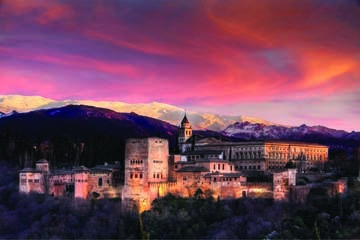 This stunning fortress is the culmination of Moorish design and once housed some of the best minds of their time, as well as being a melting pot of many of the known religions. 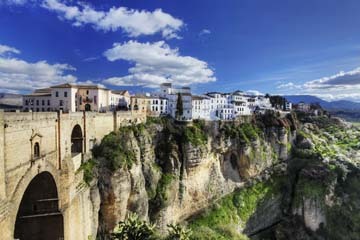 Our further travels take us to the picturesque city of Ronda, situated on the edge of a cliff along a canyon – its dramatic views make it a scenic wonder. Lastly we will ended up in Seville, home of Flamenco. Here we will take a carriage ride through its streets, visit the Alcazar, experience Flamenco and sample some of the local wine. 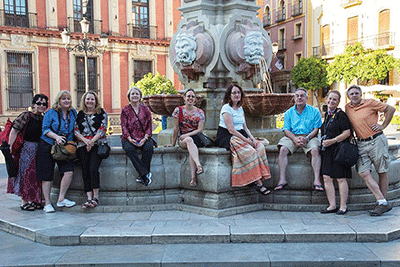 Scott will take the photographers on daily walking tours where you will have the opportunity to experience Spain through your lens as Scott guides you to use your camera to define what you see while achieving your own artistic vision. 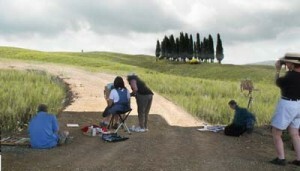 As with the painters, there will be daily destinations with time allowances for exploring on your own. So come join us as we take you on an inspirational exploration of Andalusia and its surroundings with an emphasis on observation and perception as we help you develop your own style. * El Greco Museum & Toldeo Museum pass. Simply send a completed application form along with your deposit of $1,500 per person. Prices after 10/31/15 are based on current airfare. Application forms will be provided upon request. For those wanting a single occupancy room, there will be an additional cost of $650. We can take credit card payments, however it will incur a 3% fee. There will be no rain dates or refunds for weather or travel difficulties. We suggest travel insurance for those situations. There is something about Santa Fe that has drawn artists there for decades, the Light. 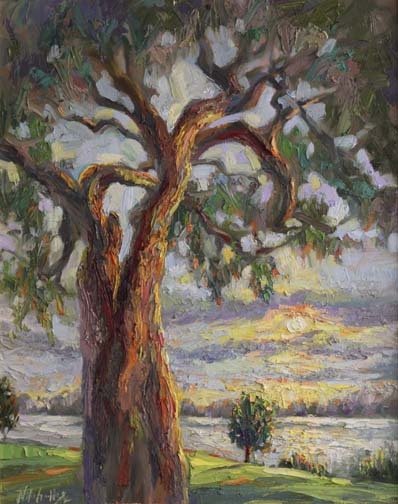 The clean pure radiant quality of the sunlight bathes the region in a glow that makes colors come alive and adds a richness to the surroundings. This is the landscape that inspired Georgia O’keeffe and Ansel Adams, now it’s your turn. Capture the beauty of a river that has carved its way through the rugged terrain or a pueblo set against a snow capped mountain backdrop. This is one of those places that allows you to witness nature’s staggering beauty amid a setting straight out of the old west. 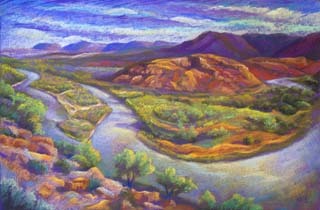 Its location affords the opportunity to capture everything from desert to mountain and from rivers to pueblos. 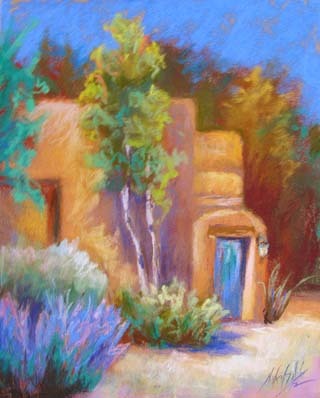 Along with its ideal climate and abundance of natural settings, it makes New Mexico an artist’s paradise. 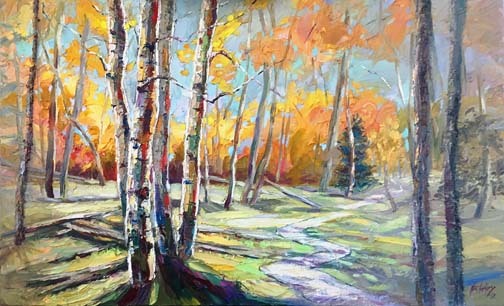 Niki will conduct the Plein-Air Painting Workshop from different picturesque locations daily, teaching through a combination of demos, discussions, assistance and critiques. Sessions will be broken into different morning and afternoon locations, with plenty of time in between for shopping, sightseeing or for a leisurely lunch. Scott will take the photographers on a daily tour where you will have the opportunity to experience Santa Fe through your lens as Scott guides you to use your camera to define what you see while achieving your own artistic vision. As with the painters, there will be daily destinations with time allowances for exploring on your own. 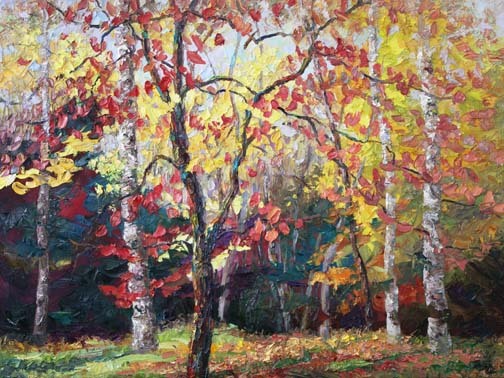 This unique Workshop affords you the option to choose which aspect interests you, whether it is painting, photography or both. 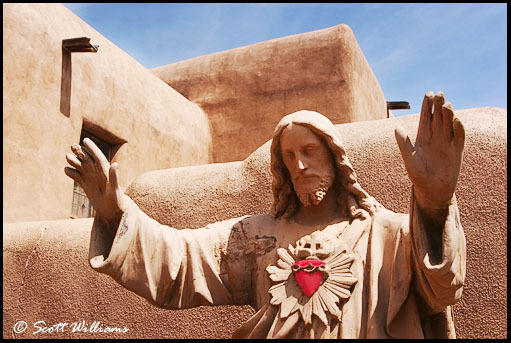 Thereby giving you an opportunity to make the most of your Santa Fe experience. There will also be valuable critique sessions throughout the workshop. This will give everyone an opportunity to discuss the day’s events, compare notes, ask questions and get a chance to know each other. 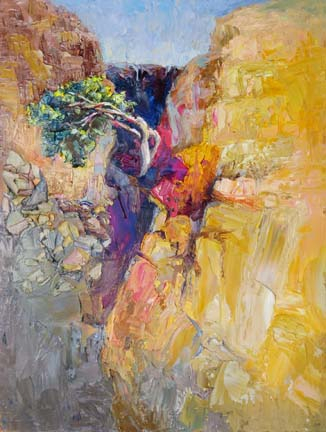 It also presents a unique option to get views and perspectives from both painters and photographers. 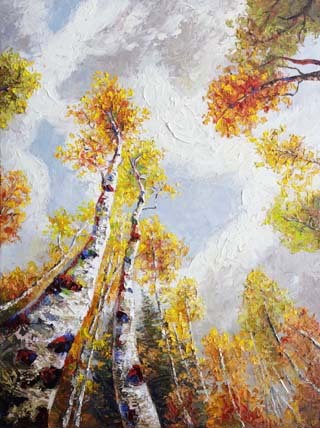 Niki has been painting for more than 20 years, and is a nationally acclaimed artist whose work is much sought after and collected, as well as being an accomplished painting instructor with over 10 years of experience. Scott has taught college photography, has led workshops in the US and Europe, is a guest lecturer and is a working commercial photographer. Both Niki and Scott are passionate about art and love helping others refine their skills while guiding them to find their own muse in life. So come join us as we take you on an inspirational exploration of Santa Fe with an emphasis on observation and perception as we help you develop your own style. Space is limited on a first-come / first-served basis, so we encourage you to enroll as soon as possible. Please let us if you have any questions or if we can help you in any way. We hope that you will be able to join us! To see Scott Williams website, go to blind-squirrel.org. Our previous adventure took us to England, so it seemed only fitting since we were so close that we should make an additional trek to Ireland. This Journey will take us from the epicenter of culture in Dublin, to the imposing Cliffs of Moher, through the colorful village of Adare and finishing at the Dingle Peninsula. Dublin covers the spectrum of things to do and sights to see. Setting on the mouth of the Liffey, it is unprecedented as a two-cathedral city and is the heart and soul of Ireland. Spend your time while there walking the hallowed halls of Trinity college to see the book of Kells, admire their two medieval cathedrals, stroll across the Samuel Beckett Bridge or just stop in for a quick pint at Temple bar. From there our move westward takes us through the Burren national park with its lunar-like landscape of rocks and cliffs and onto the picturesque town of Lahinch. From our home base we will venture forth to experience the most visited natural attraction in Ireland, the spectacular Cliffs of Moher. The scale and grandeur of this magnificent natural wonder is stunning, along with some truly breathtaking vistas. Once more our merry band of travelers set out to comb the Irish countryside in search of visual wonders. One such stop along that route is the colorful village of Adare, with its many hued pubs, thatched roofed houses and castle ruins. The final destination for the majority of our stay is fit for a king, literally! Again, finding unique lodging for us has manifested itself in the form of a converted 16th century castle. This 4 star accommodation is a one of a kind, with its suits of armor, ivy covered facade, rock hewed walls and timber ceilings will make you will feel like you stepped through a doorway into another era. If the setting and grounds don’t overwhelm you, the breakfast surely will. From the buffet of fresh pastries, jams, fruit, meats, cheeses and salmon, to the full menu of additional fare such as Eggs Benedict, this is a foodie’s delight! Leaving our castle for the moment we venture forth to the town of Killarney and it is there that we find Muckross House. 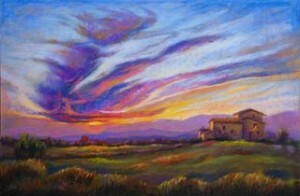 This 65 room Tudor estate with its 11,000 acres teeming with overflowing gardens, is an ideal setting for any artist. As if that weren’t enough, there are abbey ruins on the grounds as well as nearby waterfalls and just down the road is another photogenic spot, the 15th century Ross Castle set on the shore of Lough Leane. With a strategic location, its tower offered commanding views of the lake and it’s from here that we will enjoy a boat tour of some of Killarney’s beautiful lakes. Last, but surely not least, is our day trip around the Dingle Peninsula! Set along the westernmost tip of Ireland, this rugged coast with its craggy cliffs, rolling hills dotted with sheep and long expanses of sandy beaches, offers a wide array of stunning backdrops. There are also castle ruins, mountain lakes, stone huts and cascading waterfalls to round out the amazing scenery. If you have ever dreamed of going to Ireland, this is the trip for you! 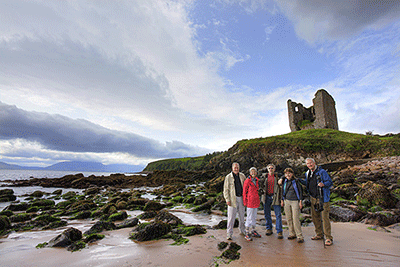 Scott will take the photographers on daily walking tours where you will have the opportunity to experience Ireland through your lens as Scott guides you to use your camera to define what you see while achieving your own artistic vision. So come join us as we take you on an inspirational exploration of Ireland with an emphasis on observation and perception as we help you develop your own style. Admission is limited to 12 participants, so we encourage you to enroll as soon as possible. There will also be space open for non-participating partners at reduced rates on a limited basis. Side trips along the way to Galway, Adare, Cliffs of Moher, Killarney and the Dingle Peninsula. There is a discount of $350 for partners wanting to accompany participants on the trip, but not take the workshop. We will also setup optional events/ classes when available at an additional cost for participants not interested in the painting/photography sessions. There has to be a minimum of 6 people for the workshop to make. If the 6 person minimum is not met by the 10/15/16 deadline, deposits will be refunded. You’ve seen the images of the people with elaborate costumes and ornate masks set against the stunning backdrop of Venice. Well, now is your chance to not only be a part of this fabulous spectacle, but to also capture the festival in all of it’s glory. Imagine working on your photography and painting skills in an environment with such visual stimulation and artistic opportunities. Join us as we take you on an journey among a cast of characters that have stepped out of a long forgotten time as they stroll amid the grandeur of the Venetian canals. Every corner brings you face to face with new subject matter and backgrounds that afford you endless possibilities to spark your imagination. 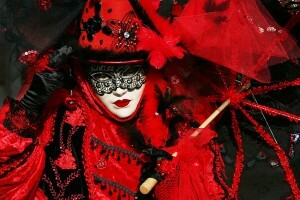 There will be walking tours through the back streets and canals of Venice as we go in search of opulent costumes and dazzling masks in a setting like no other place on earth. 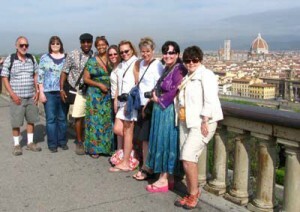 You will experience the sights, sounds and passion of Venice as you are immersed in Italian culture. Every time we go, we feel like a kid in a candy store! 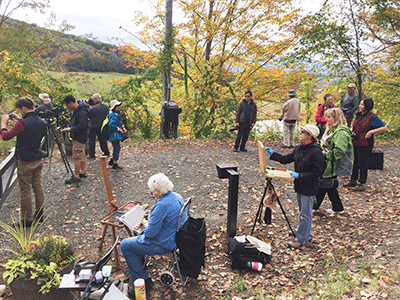 Niki will conduct the Plein-Air Painting Workshop from different picturesque locations daily, teaching through a combination of demos, discussions, assistance and critiques. Sessions will be broken into one half day outings of either morning or afternoon locations, with the other half day set aside for exploring the cultural side of the area. 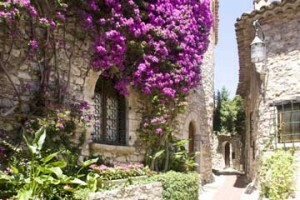 There will also be plenty of time in between for shopping, sightseeing or to dine al fresco for a leisurely lunch. Scott will take the photographers on a daily walking tour, giving you the opportunity to experience the trip through your lens as he guides you to use your camera to define what you see while achieving your own artistic vision. As with the painters, there will be half day destinations, with time allowances for exploring on your own. 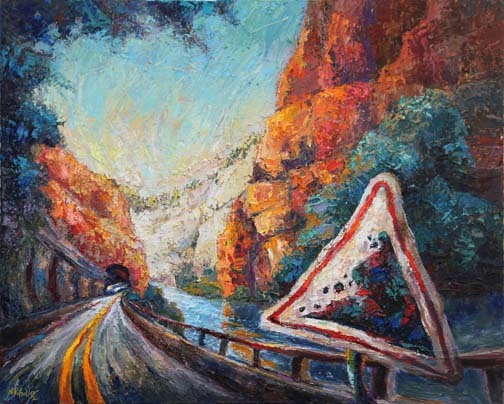 This unique Workshop affords you the option to choose which aspect interests you, whether it is painting, photography or both. 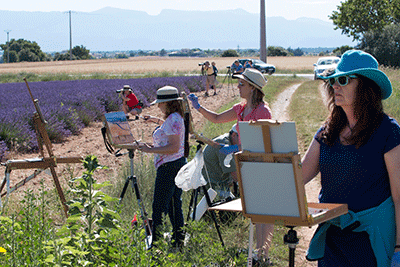 Thereby giving you an opportunity to make the most of your Art Treks experience. There will also be valuable critique sessions throughout the workshop that can provide invaluable information and feedback, as well as giving everyone an opportunity to share ideas and get to know each other. There will also be opportunities each day to see the museums, visit the churches, go shopping and enjoy all of the things that make Venice what it is. So come join us as we take you on an inspirational exploration of Carnival with an emphasis on observation and perception as we help you develop your own style – or just ride along to enjoy the countryside, as artists and non-artists alike are welcome. 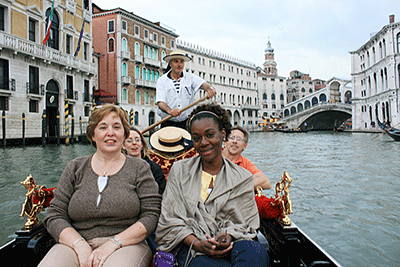 Roundtrip air fare, all transfers in Venice. Your cost for all of this is $4,395 and to reserve a spot, simply send a completed application form along with your deposit of $1,500 per person by 6/10/17, after that the price goes to $4,995. There also is a final application cut off date of 8/5/17. Prices after the cut off date are based on current airfare. A second payment of one half of the remainder after deposit is due by 9/9/17, with a final payment due by 10/21/17. For those wanting a single occupancy room, there will be an additional cost of $750. We can take credit card payments, however it will incur a 3.5% fee. 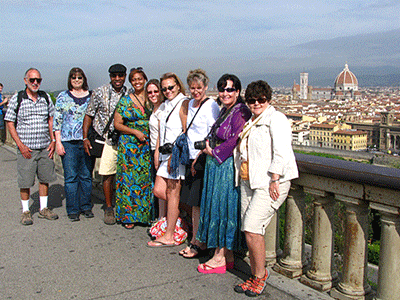 Side trips to Siena and Florence, as well as to the wine town of Montepulciano. Your cost for all of this is $5,095 and to reserve a spot, simply send a completed application form (the forms will be provided by email upon request) along with your deposit of $1,500 per person. There is a final application cut off date of 1/6/18. Prices after the cut off date are based on current airfare. 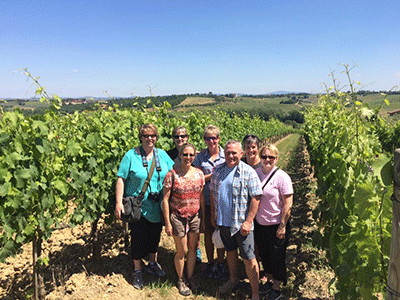 There is also the possibility of combining the Tuscany trek with our Cinque Terre & Lake Como trek for an amazing two week Italian adventure. So be sure to check that out for more information! For those wanting a single occupancy room, there will be an additional cost of $750. There is a discount of $350 for partners wanting to accompany participants on the trip, but not take the workshop. We will also setup optional spa tours and food, wine or cooking classes where available at an additional cost for participants not interested in the painting/photography sessions. In the event of inclement weather, arrangements will be made for museum visits etc. There will be no rain dates or refunds for weather or travel difficulties. We suggest travel insurance for those situations. E-mail Niki Gulley for more information and to register for this amazing trip. 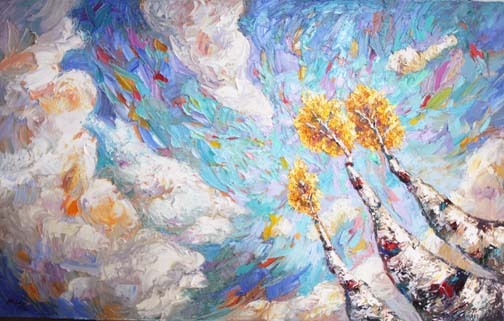 To see more of Scott’s Work, visit his website at blind-squirrel.org. To see more information on the trip and additional photos from previous Tuscany workshops, visit blind-squirrel.org/workshop.htm.